Dice half of the avocado and leave the other half for later. 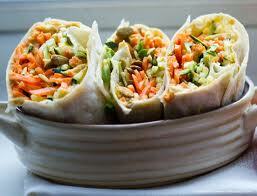 Gently mix the diced avocado, carrots, spinach, cucumber, mushrooms and cheese with the Italian dressing. Carefully fill each pita with ¼ of the mixture. With a fork, mash the other half of the avocado. Then stir in the lemon juice and the tomato. Spoon this mixture inside each pita. Serve.